We will explore the meaning of transformation and transmutation. It can be easy to be excited about change and a new beginning but how do you keep the momentum going? Come celebrate the ordination Diana Kay McLean into the Unitarian Universalist ministry. Diana will be ordained by her home congregation (Boulder Valley UU Fellowship) and her internship congregation (UU Church of Boulder). Clergy are invited to arrive at 2:30 pm to robe and process. Reception will follow. A Memorial Service for our dear friend and church member, Judith Meyers, will be held at UUCG on Saturday, July 23rd at 3pm. For those of you who aren’t aware, the Lutheran Family Services Refugee & Asylee Program office is a ½ block from our UU church and has been using classroom space at the church for job readiness classes on Tuesdays and Wednesday afternoons. The UU church of Greeley has also participated in a winter attire drive last winter and helped Sarah Gostenik provide baby carriers to refugees in Greece this last March. Now, gearing up for the upcoming school year, LFS is hosting a backpack drive for refugee and foster care students in our area. If you’d like to participate, please see the flyer on the bulletin board in the foyer for details and you can drop off at the LFS office (1502 9th Ave) by July 22nd, or contact Sarah at sarah.gostenik@lfsrm.org. You may also contact Sarah if you have an interest in volunteering with LFS or learning more about refugee issues. Thank you for supporting our refugees from Somalia, Burma, Cuba and Eritrea and making them feel welcome in Greeley as they work towards self-sufficiency! 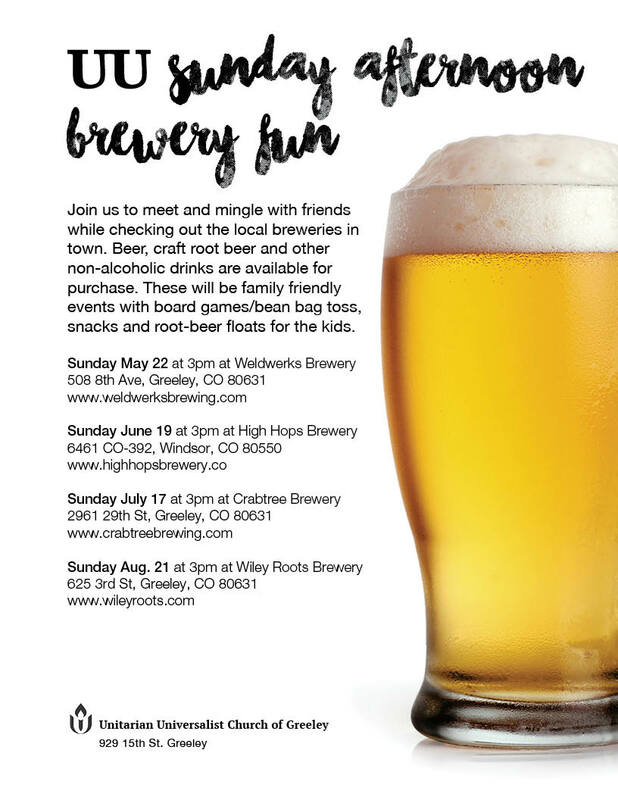 Join us to meet and mingle with friends while checking out the local breweries in town. Beer, craft root beer and other non-alcoholic drinks are available for purchase. These will be family friendly events with board games/bean bag toss, snacks and root-beer floats for the kids. Click HERE for the official flier!